So instead of using a different tool, why not find a tool that will perform multiple functions with one click of a button. Here is a list of complete website analysis tools that will analyze a number of factors that go into a well optimized website. 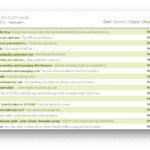 Probably the most popular and used website analysis tool out there, Website Grader analyzes a complete list of on-page and off-page factors. Hubspot, the creators of Website Grader, also have other similar functioning tools. They are Twitter Grader, Facebook Grader, Press Release Grader and GobbledygookGrader. WooRank is a relatively new website analysis tool, however it is very robust and ranks up there with Website Grader. It offers all of the main data that you would want anlayzed, like met-data, link popularity, and traffic estimates, however a few neat features that it looks at are the server information and page loading time. With Google placing more emphasis on load time, it is an imporant factor to have in a website analysis. Not the most visually pleasure report, however it still returns a lot of great information. At the top of the report they give you a site trustworthy percentage out of 100. If you sign-up they will give you tips on how you can improve each section that they analyze. A very nicely designed analysis tool, they will give you some high level data and scores. They provide a “technical” score, a “SEO score”, and a “popularity score” that will determine your overall score. If you sign-up for an account you will receive a more in-depth report, that will look something like this. 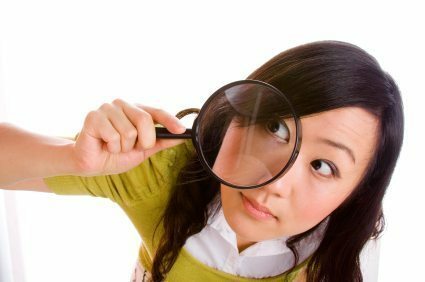 Another website analysis tool that will give you a lot of the higher level information. One thing I did like about this tool is the ability to see source code, JS and CSS file sizes. 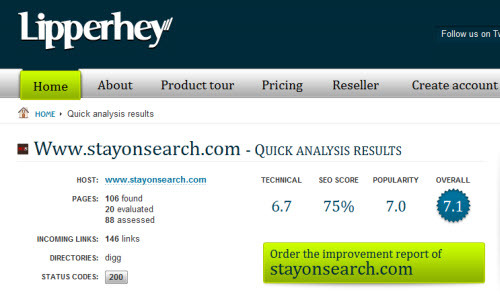 The SEO analysis tool is only one of their many suite of tools that they offer. 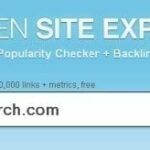 They also have tools for search engine rankings, keyword research, link popularity, broken link checker, url redirect checker, server status, http headers, and more. 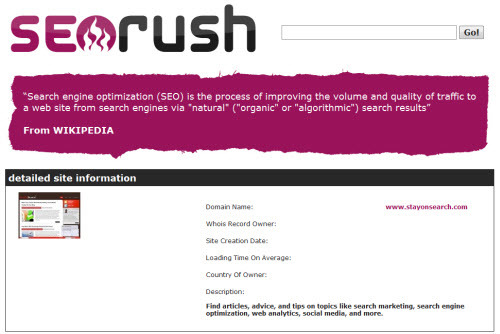 SEO Rush has a real-time “previously SEOrushed Sites” that will show you sites that have been recently analyzed. This tool will again give you a lot of the high level data. The design and layout is very nice, however I think they could beef up the amount of data it returns. Pear Analytics offers a free and paid version of their SEO analysis tool. The free version allows you to analyze 1 page, 1 competitor, 10 keywords, no client access, and 1 automated report a month. Paid versions start at $39.99 and go up to $299.99 a month. 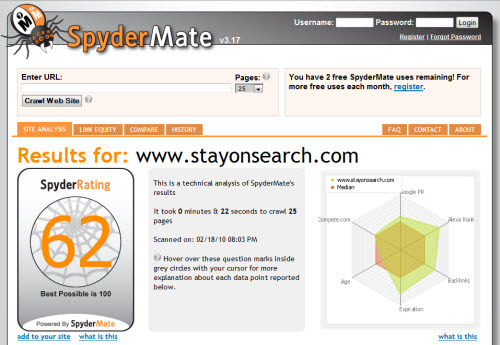 SpyderMate gives you an overall score out of 100, based on a number of factors that their tool analyzes. If you register for Spydermate you can take advantage of their competitor comparison feature. A few neat features that I liked are the Export to PDF and Share with Someone abilities. Although this tool analyzes a lot of factors, much of the data is in its raw form and is not necessarily pleasing to the eye. However another good choice if you are looking to receive a lot of data about a site with the click of a button.